I wanted to visit my ex mother-in-law in Cape Town. I hadn't seen her for many years and I felt I needed to reconnect with the my son's grandmother. I was excited to visit Cape Town and looked forward to experiencing a place I had heard so much of. I eagerly booked my flight from Perth and decided the urgency required I get a direct flight, so booked through South African Airways. The day finally arrived to leave and I couldn't wait to board the plane. 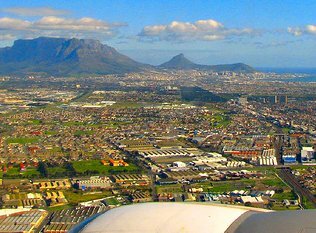 The 11 hour flight was luckily uneventful and we arrived safely at the OR Tambo Airport in Johannesburg in the early hours of the following day. After collecting my luggage and making my way to the domestic terminal I checked my luggage in again and found my way to the departure area. Unfortunately there was a delay with the flight and the wait was longer than expected. By now I had become very weary and was now just wanting to reach my destination. When the plane finally arrived we boarded and were once again on our way. The flight was shorter than I expected and no sooner had we taken off than it was time to disembark and find my way to the luggage carousel. Finally, I was making my way out and was just hoping that my family would be there to meet me. At first I couldn't find anyone and felt very uneasy being in a strange airport, extremely tired and no one to collect me. To my relief I finally saw a familiar place and was ushered off to the waiting car and we set off. At this point in time Cape Town was undergoing extreme road works and there were long delays which made the journey even more tiresome. After our arrival, we caught up had a coffee I was by now more than ready for bed, having been awake for 24 hours! The following morning the sun was shinning and after a good breakfast I felt normal again and ready for an adventure. The highlight of my stay in Cape Town was taking a trip to the southern most tip of Africa. As we drove along the coastal area through Hout Bay I saw some of the most breathtakingly picturesque scenery to say the least. We stopped in Hout Bay and took a walk along the waterfront. The colourful stalls selling their wears entices one to stop and look and in my case I couldn't resist buying! A little further along were a group of buskers who eagerly shared their love of music in a flamboyant and theatrical way, so very entertaining and happy to please. I was especially taken with the fishing boats in the harbour which offered me such perfect painting subjects! What a feast for the senses. Africa beats to its own pulse and rhythm which is intoxicating. We finally wound our way to Chapmans Peak and on to Cape Point. We decided to take a walk as far as we could go to make the most of this incredible vista where the Indian and the Atlantic oceans come together with a mighty force. As far as the eye could see, stretch the powerful oceans and one can not help but imagine what this coast must have been like to negotiate in the ships of old. A test of courage and bravery. As I stood below the signage showing the direction of distant lands in all directions I felt so small in the scheme of things. The mist started rolling in and it was time to go so we headed back to Cape Town. This time via another route through Simons Town, Fish Hoek, Kalk Bay and many of the smaller coastal towns each with their own unique character. From small meager buildings to the plush luxury of Constansia, this is indeed a place of contrast. We drove up a winding road and stopped off at Signal Hill. We got out the car to look at the surrounding view. Looking back inland towards Lions Head I could see the majestic Table Mountain keeping watch over the city. What a sight to behold. Unfortunately on this day it was too windy to go on the cable car ride to the mountain top. However standing there looking at this mighty mountain from this vantage point was just as impressive I am sure. To the other side overlooking the ocean stands the somber Robben Island. Captured in time it is hard to image that former President Nelson Mandela, affectionately known as Madeba, spent so much of his life there, and managed to come out of incarceration and lead a country. What an extraordinary man. Looking down the Green Point soccer stadium could be seen looking very impressive from this angle. From high above it resembles a space ship, something from the future. From here we headed down to the famous Cape Town Waterfront. Running out of time it was a whirlwind tour. 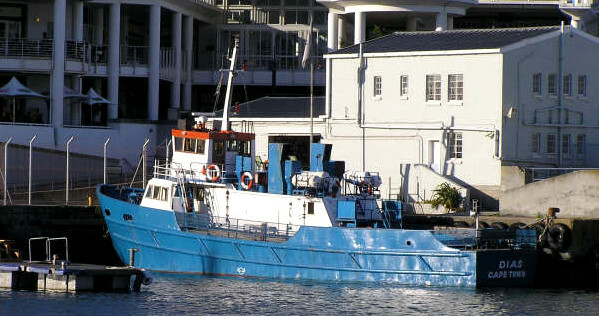 There was however one very special request I had from a friend in Australia and that was to seek the whereabouts of a boat called the DIAS. The reason being that the original design for this boat was done my friends father and she wanted me to take a photo of it. The Dias was later used to transport prisoners to Robin Island and supposedly carried Mr Mandela. To my absolute amazement I found the boat in the Victoria wharf in all it's glory. I took a couple of photos for my friend who was absolutely delighted. When she showed them to her father he had tears in his eyes, clearly overcome by emotion. That made my heart sing. Sadly he has since passed away. I had one last request before I left and that was to be able to stand on the Bloubergstrand beach so I could take my own photos of that iconic scene of Table Mountain which has been depicted in so many times paintings. Now hopefully I can now do my own! My time in Cape Town was brief but extremely memorable and I hope to go back and explore this truly beautiful place. At the top of my list is to visit some of the famous buildings that were built by my Fick ancestors, such as The Burgerhuis, once known as The Fick House, the original Lanserac House now famous for it's wines and the Rembrandt Van Rijn Art Gallery. Something to look forward to. I left the shores of Cape Town and flew to Port Elizabeth but that's another story. Submitted by Paula Wiegmink on 21 May 2013.